One’s first impression of the Navetta 37 is that of a modern yacht that possesses the gravitas, stability and durability of a blue water cruiser, but is balanced by the designer’s masterful ability to deliver it with a light touch. Planted on the ocean thanks to its beam, the carefully studied naval architecture of the Navetta 37 provides the versatility to package with no less than five different engine options. Those less willing to trade a few extra knots of top end speed for extra range may opt for the twin 1,400hp MAN V12’s that produce 15-knots and a range of 1,150 miles, those for whom getting to a closer bay quicker is a priority may push the top speed up to 17.5-knots by installing the 1,825hp CAT C32 12V’s. The whole ethos of the Navetta genre is one of cruising in almost complete silence and during our visit to the shipyard we noted that ‘large yacht applications’ were being employed on the Navetta 37 to optimize the reduction of sound and vibration. When we visited the finished yacht during her debut at the Cannes Show in September, we stepped aboard to discover a spacious cockpit that sets a relaxing tone. The wide aft banquette demonstrates versatility as the backrest can be moved so that it doubles as a sunpad. Through the picture windows one is enveloped in the calm of the main salon, laid out in a fairly traditional configuration with a lounge area to starboard and low cabinetry partitioning off the formal dining area. From the starboard guest lobby guests can descend to their accommodation deck, where four guest cabins, all lit by some of the largest port lights in the market, are located. Twin inboard facing doubles mirror each other aft, with their sumptuous en-suites buffering the cabins from the engine room bulkhead. 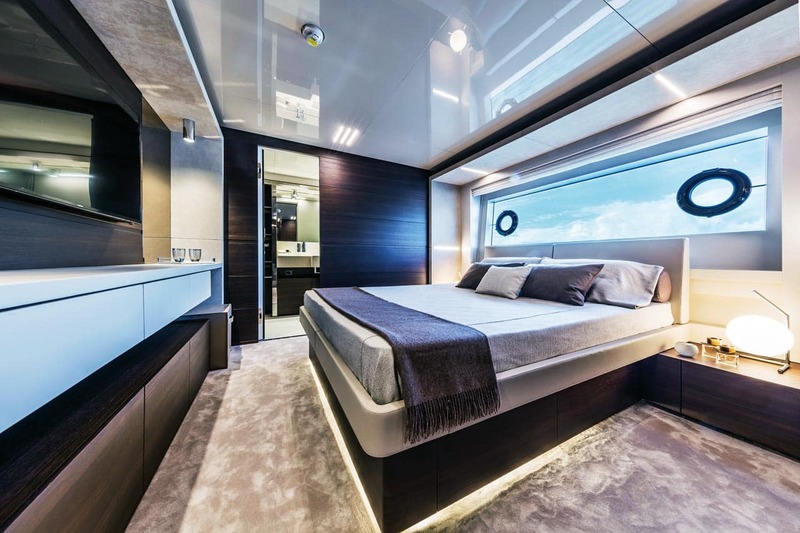 The portside forward cabin can be considered a VIP, while the forward starboard cabin is a twin. Opening portholes in the long glazed windows allow for the introduction of fresh air, while details like the sumptuous leathers used to dress the furniture and headboards certain contribute to the opulent ambience. The on-deck owner’s staterooms occupy the entire forward section of the main deck. Comprising of no less than four separate areas, one enters through a private office of proportions one would usually associate with a mega-yacht. Here bookshelves line the inboard partition while large windows make this the perfect area to enjoy such a wonderful vessel. There’s even an opening window to allow in a fresh salty breeze. A large forward facing berth commands the space and the furnishings are completed by a vanity desk and leather ottoman. The owners also enjoy their own symmetrical en-suites, joined by a central shower cubicle. The upper deck salon offers guests and the captain a surprising amount of space, primarily thanks to the full use of the upper deck’s available beam and a wonderful lounge with custom-made C-shaped sofa. Heading aft, through the tripane picture windows one finds the forward section of the terrace features a Paola Lenti Sunseat table, allowing up to ten guests to dine al fresco. At the sundeck we found a private area dedicated to relaxation, where the two curved pillars that support the hardtop lead to a forward Jacuzzi. Centrally a wet bar ensures guests are well lubricated. 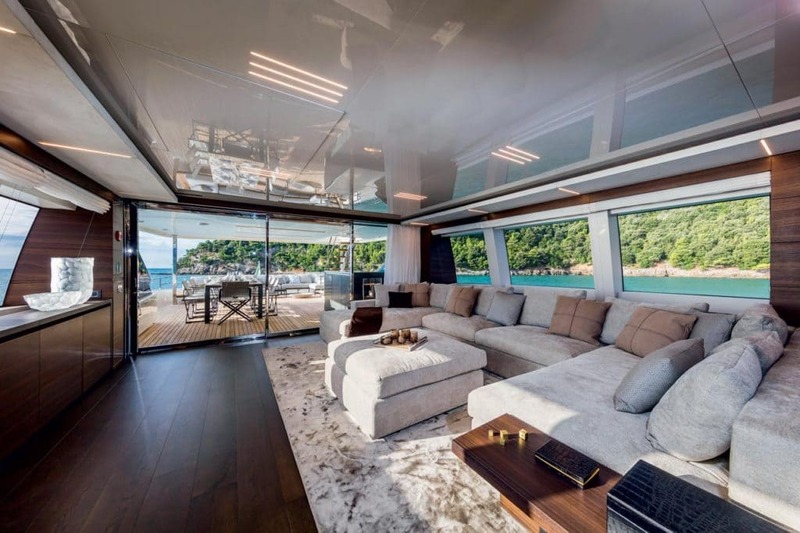 There’s also the foredeck solarium featuring a big sofa, two tables and a large sun pad under which a personal watercraft is neatly concealed in its own garage. The Custom Line Navetta 37 is actually quite difficult to summise in any other way than… this it epitomizes precisely what a Navetta should be. With their new flagship The Ferretti Group’s shipyard, along with Zuccon International Project, have produced a vessel that not only epitomizes exactly what a traditional Navetta should be but have incorporated all the features and styling of a contemporary superyacht.